Andy tackling the final pitch of Goodro's Nightmare, 5.8. The day started out with high hopes of reaching a beautiful crack by the name of Sinsemilla Crack, 5.10 (http://mountainproject.com/v/sinsemilla-crack/105824463), high in the Green Adjective Gully. Ultimately, we were thwarted by a scary looking 3rd class series of moves to obtain the platform in which this crack existed. Instead, we turned around and climbed Goodro's Nightmare, 5.8 (http://mountainproject.com/v/goodros-nightmare/106206272) instead. It was obvious that that route has not seen many ascents, but it was fun nontheless! 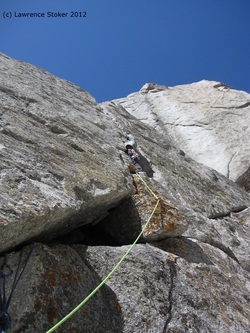 The best part of this climb was the offwidth nature of the crack. Wide, but not flaring. Took protection well. It should be noted that the last pitch has many lose rocks (some of substantial size!) Bring your helmet.